This 5 Bedroom, 2.5 Bath Cul-de-sac Home sits on a Large Grassy Lot gently sloping to the lake with unobstructed views of the lake and framed by huge mature trees. We just remodeled the home adding waterproof wood-like floors, new paint, and completely remodeled kitchen and appliances. All furnishings are new, fresh and well acquainted, including 2 55” TV’s, one in the Living Room and one below in the separate den, (also looking out on the lake). We also have 2 portable mats for children if you have a party of 12. We are a family of 6, now with our oldest son married and living in Nashville. We live in Southern CA and raised our children near the beach and water. We love family, spending time together, and making great memories. We purchased this property because we love Lakefront living. I love to fish and can now do it out my backdoor. Our children enjoy boating and all the fun it affords. My wife, Debbie, always wanted a lakehouse. So here we are, owning this home, enjoying it and sharing it with people like you. :) We decided to make is a vacation rental and share it with those who love relaxing, spending quality time with their family and friends. Whether its for weddings, wedding showers, business functions in the area, family vacations, family reunions, you name it. We will take great care of you and your group. We have been homeowners and income property owners for many years and understand and appreciate quality and caring for property. 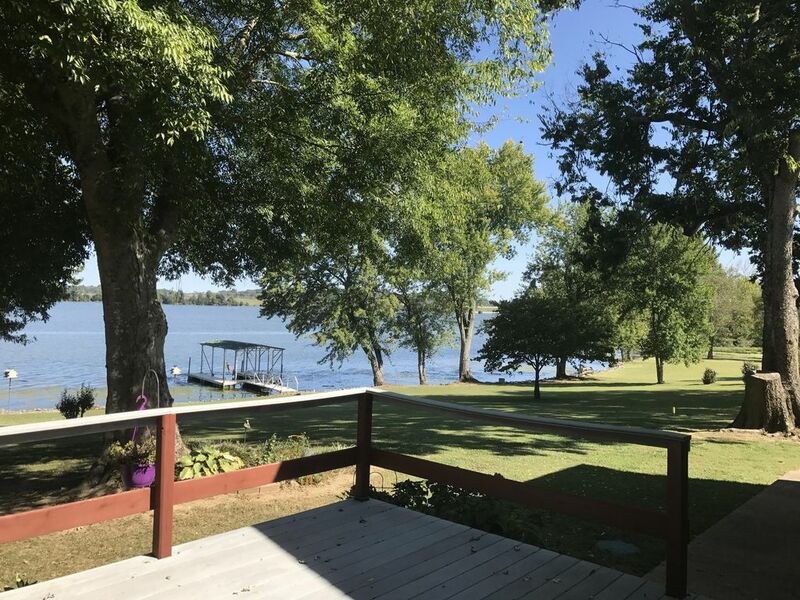 Our home is not too big, yet has all the amenities of a cozy, comfortable, well acquainted home that allows you to relax, spend time with others and enjoy the lake view from many parts of the home. We have 2 kayaks available to use as well, 2 singles ($100 fee to use both kayaks) There is nothing like an early morning or sunset kayak cruise to enjoy those you are with and see the lake. All bathrooms are original clean, almost a retro feeling. We love them. 4 cars can park in driveway easily. Separate Den with Lake view and 50” Smart TV for all of your Online Entertainment Accounts Numerous Board Games near the Fireplace in the hearth. Smart TV for Pandora, Spotify etc. 1 acre of gently sloping grass to the lake with Firepit on lawn to enjoy in the evenings. Lawn Games located in the Garage Enjoy the Hundreds of Birds that sing all day. The house was great recently updated great location for us. House had plenty of room and was great for our month long stay. Would definitely stay again. Great Property recommend highly if your going to the Nashville area or just a get away on the lake. Our family of 6 had a great time at the lake house as we were here for a wedding. The rooms were spacious and the decor was nice; kitchen was well equipped. Nice view of the lake from 2 rooms and nice deck and dock. The house was perfect for our two families. The kids enjoyed the separate space downstairs. Thank you for having all of the necessities available for our use. Our kids didn't seem to mind the moss in the lake and enjoyed swimming. Beware of the leeches. The property was excellent. The home was spacious enough for our crew of 10 adults and laid out well so never felt crowded. The home provided all the little amenities, which has not been our experience in past rentals, from items in the kitchen to the bathrooms, we wanted for nothing which gives the homey experience. We enjoy the outdoors and the large yard was prefect for our many yard activities. A very serene place with some unexpected wildlife sightings. The only issue, which was not in the property's control, was the recommended boat rental facility is no longer renting. I am so sorry that the boat rental we suggested no longer rents boats. We had no idea they had stopped rental service since the owner had recently rented a boat to check it out and get details for future tenants. We have now secured a rental facility that will deliver the boat right to your own dock AND you can keep it overnight! We are excited to offer this for all our vacation renters. My friends and I were amazed when we walked into the house to see how nice it is. Plenty of room, great appliances, and a bluetooth compatible entertainment system. The kayaks were so much fun to take out! We caught plenty of catfish off the dock as well. 5 stars. The trip was everything we could hope for and we look forward to coming back.